“You said you would never work for Gil. Vince Vaughn in a crime movie where he plays a rough-looking drug dealer? You gotta be kidding me. Although he surprised me with an excellent part in “Hacksaw Ridge“, I always associate him with feel-good, romantic crap movies with the kind of humor I never laugh about in most cases. Well, I was totally wrong this time. Vince Vaughn is ruthless, mega calm and ultra-brutal in this extreme violent film. Better yet. He’s even funny now. Funnier than whatever comedy he played in before. And this thanks to the dryly, humorous remarks he makes sometimes. The moment someone mentions his name again, I’ll see that tattooed cross on the back of a bald skull directly in front of me. Vince Vaughn isn’t having fun here. Life hasn’t been so good for Bradley (Vince Vaughn). After being fired, he finds out that his wife Lauren (Jennifer Carpenter) is cheating on him. Next he starts working as a drug runner to bring in some money. Before he knows it, he’s facing a long prison sentence because of a failed drug deal. And from that moment on, the movie changes into a higher gear. Indeed, the movie wasn’t really fast till that moment. Before you even see anything of a prison, you’ve been watching the screen already for some time. And then it goes from bad to worse for Bradley. His wife is being kidnapped by the leader of the drug gang (who wants to regain his financial loss) and Bradley has to kill an inmate who’s locked up in cell 99 in the heavely guarded prison of Red Leaf. Not a movie for sissies ! This is without a doubt Vince Vaughn’s best acting achievement ever. Finally his impressive body is being used for the right purpose. Relentlessly beating up opponents and transforming them into a pile of crushed human flesh. Something that’ll happen regularly in this ultra-violent film. Every time it looks as if Bradley has to lift his immensely heavy limbs and strike a guard or another criminal with devastating force in the face. The result is always repulsive brutal. Seeing a skull bursting open like an overripe tomato or the awareness of what the Korean is going to do with Bradley’s wife, may be a bit too much for some. 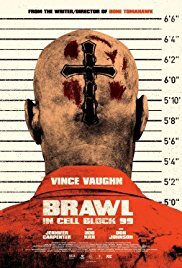 “Brawl in cell block 99” certainly isn’t a film for sensitive viewers. But this sadistic violence serves a purpose. Bradley has a specific goal in mind and is therefore forced to take this violent path. There were a few things in this film that shocked me. The fact that I didn’t recognize Don Johnson baffled me. Was it because of that gigantic mustache? Or was it his age (he’s already 67 years old)? Or is it just me? And then of course the fact that I’m speechles about the acting of Vince Vaughn, who clearly deviates from his usual acting pattern. I don’t think of Vaughn as being one of my favorite actors. But after his performance here, I have to revise my opinion about him. And finally the impression this film made on me. I’m not easily shocked and got my share of extremities used in movies. But this time I was a little bit out of my depth. Somehow the movie messed me up. And that’s not necessarily because of the explicit violence. It’s the overall feeling. I do know that next time I come across a movie with Vince Vaughn playing in it, it won’t be so obvious to just avoid it. He literally knocked himself to the top of my list of “the better” actors.